Thirteen experts contribute nine chapters and five case studies, including a new case study on women in Chinese traditions. 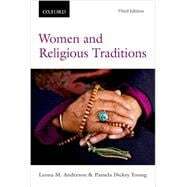 This third edition builds on the strengths of the first two, with the addition of lived religion content in each chapter, an expanded introduction to the study of women and religion, new research on Buddhist nuns, and up-to-date material on women's current political position in Islamic countries. Leona M. Anderson is Professor Emeritus, Department of Religious Studies at University of Regina. Pamela Dickey Young is Professor of Religious Studies at Queen's University.